This is a high tier quality sports anime. All I have to say is this sports anime about volley ball is of high tier quality. It has great dialogue, mimicking of good quality dialogue like Kuroko, Eyeshield 21 or Prince of Tennis. Watch this one sports anime lovers, this one is gonna be good. The main character has this aura about him that makes the entire series, and there's a good rival for him too. Enjoy the ride for this one. I am not a fan of the anime for Eyeshield21 and Kuroku basketball. But sports anime always have an exciting appeal. But volleyball? I played volleyball in high school. I must see this! Volleyball isn't nearly as mainstream as soccer or rugby or other big sports but it is a sport to be taken seriously. And the main character radiates his passion right away! The characters in this title are not afraid to show a little more emotion. Expect great things from each character as they develop in character and in strength. The animation is pretty fitting in that it gives you that feeling of intense movement and dynamicity. I have watched the majority of sport anime on the website; football, baseball, soccer, esc... This anime proves to be a fresh, but just as great experience with the rest. The characters are fleshed out and spew emotion, the animation is very smooth and action packed, art style is really nice and crisp with something unique I fail to pinpoint but really is really appealing. The anime had my full attention quickly, while keeping me attentive, cheering, and overall excited. If the first episode is any indication of what to expect, the show will be a blast that I myself cannot wait to watch each week. Simply put; I see a lot of potential in this anime and the overall outlook is really nice. It sends out a sort of "Kuroko's Basketball" feel to it which is really nice. It's a nice anime with what seems like good character development. I would easily give this 5 stars. I can't imagine how many years I would dream to see something like this made, told by someone else's perspective that will not only draw some of the very people that enjoy sports, but volleyball itself. Going as far back as actually understanding, playing the sport, and the like, the technical portion of the background so far has been very accurate (which makes it even more enjoyable just like Hajime No Ippo and Initial D of the likes). The comedy portion so far from the episodes here is more like Eyeshield 21 and a little bit of Naruto as I can only expect a lot of WOAH moments that will make it very enjoyable to watch all around. Even for just the preview and the 1st episode of of the opening gave me goosebumps as I remembered so much of my old days of learning what it was like to always want to play with people, in an organized sport and really dive deep into team work and character building throughout the season. 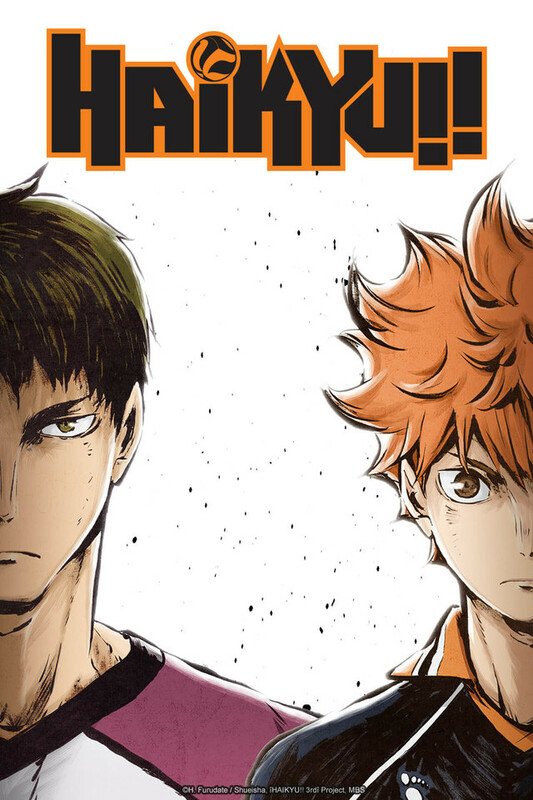 Unlike Kuroko's Basketball where the storyline can be held by round-robin individuals in a tournament, Haikyu will definitely have a lot of power up team-up moments and also a lot of double-portions of obstacles which will attract me to watch this to the very end and craving for more. The down side to all of this is that just like any anime story line, I'm expecting some kind of multi-level antagonists which will obvious make us all roll eyes, but I hope the twist will come in later for more growth as like any sport anime, there's a cap or threshold to them due to the "high school era" of any sport as their prime time of the character's life. I hope to see that volleyball or the sport isn't a sport in itself, but a lifestyle of how one carries through many episodes that friends and teammates are great to have on and off the court, which I think story lines like Naruto and Bleach can go on for so long: it's because they aren't bound to a set of rules within a community or situation. 1st and 2nd episodes so far have a really good pace and I'm looking forward to finding the manga for it just to get a better feel if this is truly what I'll be spending my nights watching over and over again because it has that nastalgic (sp?) feeling to the sport of being technically accurate. I would never have thought to see a back-side slide "by accident" in the 1st episode, but I'm hooked after seeing how well everything is drawn and the approach and spikes look proper (the sets could look a little better with the hands, but hey, that only happens in a split second). I would like to see some amazing 3-finger one-hand sets or one-hand chop sets if our heroes claim that they are that good in the anime! Volleyball always hurt my hands but.. I agree with the review about the knb vibe. After the third ep, I do feel like there could be some rather nice character development/friendships brewing. That's a BIG thing for me in any sports anime, the teamwork and determination really makes the sport so much more appealing. Once I fall in love with the characters, I will love the sport as well. Worth every minute of your time! I love everything about this anime. I'm familiar with the manga so I dare guarantee that you'll love it as much as the anime, plus the arts. The characters look better in the manga but well what can you say? I think the anime has a really good pace so that it's not too tedious but also not too fast and leave out some huge important chunks behind. The build-ups are great. The bottom line is I just can't get enough of it! I recommend this show! It is funny and I also love how passionate the main character is about volleyball. I myself play volleyball on my high school team and I love it. The animation were pretty good in mimicking how they bump, set, and spike. I love how intense and funny it is at the same time! Even though there are only a few episodes as I'm typing this, I think it's fair to say that this is going to be an excellent series. After watching the first episode I immediately fell in love with the characters, the art style, and the sport they play, leaving me hungry enough for more that I read through the available scans of the manga in a couple of weeks. Now I can't wait to see their thrilling matches in motion. The series is well animated with nice music, and the voice actors do very well in portraying the characters' personalities. The writing is fun and hilarious at times but evokes strong emotion when it needs to. My only gripe is this; while the male cast is colorful and interesting, the female manager, Kiyoko, is rather lacking. It feels at times as though she only shows up long enough for someone to comment on her beauty, and she barely talks or shows any emotions until fairly far along in the series. It's not enough for me to drop more than one star, but it does bother me at times. All in all, it's got amazing potential and, to sports anime fans like me, I can't recommend it enough. Even if you aren't interested in volleyball, the charisma and depth of these boys are sure to draw you in.